I wonder if it would be possible to heat the plate someway and actually bend it slightly? Reshape it a bit. If I measure my two bold chinook bases with a straight edge, I see about 1/16 of an inch concave which I can easily flatten out on a flat surface with the palm of my hand. I'll ask again, do you have the same non-conformance using a single-bolt twist-on universal? Regarding the Chinook two-bolt universal, the shim is made from a much more flexible plastic compound, whereas the actual base component is likely made from an injected fiber and plastic compound that is designed to be both stiff and strong. If you have to modify anything, it should be the base component. Sanding the outside 1/3 of each side of the base to develop a slight V at the edges should give you enough relief side-to-side to permit the base to be torqued down to conform properly. On the board's mast track, if you don't have approximate 1 1/2" flat on each side of centerline (3" dia. overall) to give you a solid bearing, the board may have a manufacturing problem. Lastly, you have to remember that the aftermarket Chinook two-bolt universal has a significantly larger overall diameter than a single-bolt universal would have (discounting the shim component). I'd probably start with the one that came with it, knowing that it could always be replaced. 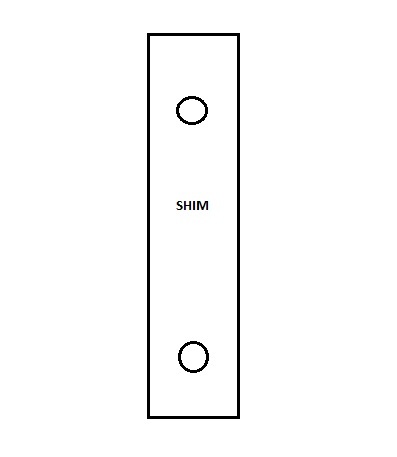 Or you could find some other kind of shim material, some kind of plastic would be best, make a shim about as wide as the mast box, put the two bolt holes thru it and place it between the base plate and the deck washer. The deck washer will conform to any deck shape, and that way the pressure between the board and base is spread out evenly. The shim obviously should be as thick as the gap you're trying to fill. Aggressively scuff up the bottom of the base plate with 60 grit sand paper or similar and clean with acetone. Apply mold relaease to the studs on the base. Mask off the deck of the board and the mast track and apply mold release to the masking. Apply West six10 thickened epoxy adhesive to the bottom of the base plate and install the base onto the board snug but not over tight. Squirt more six10 into any voids and wipe off any excess. Let the six10 cure overnight and then remove the base. You should now have a base plate that matches the exact contour of your board. Distributor, no. Starboard forum ! The Starboard distributor was unable to supply fin screws for the slot box, nor had any suggestion to obtain them. A dealer on Maui came through . The answer might be a STREAMLINED ONE. Not had this problem with any Futura's, so all a bit odd, but have only ever used single bolt chinook deck plate. I like North's universal concept. It solves many problems, and it's done quite well. Actually, it's top flight overall. It's good to know that folks that are still investing in windsurfing and improving the important design and performance details in componentry all the time.